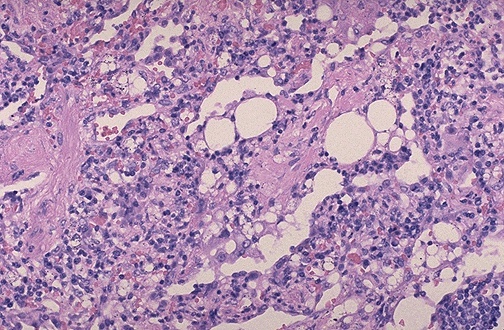 This is the microscopic appearance of an exogenous lipid pneumonia in which lipid vacuoles appear, mainly along airways, accompanied by an inflammatory response that can contain foreign body giant cells. The term exogenous refers to the origin of the lipid material outside the body. The oily material is aspirated into the bronchial tree.